Just seven days ago I was performing the last two shows of a season of Same Time Next Year and I was just starting to feel that I had settled into the role. The matinée performance was, our Director said, the best we had ever done. The unexpected (but much hoped for) series of moments when everything was perfect. It was vivid and real and full of life. Just a couple of hours later it was over – seemingly before it had really begun. What I felt most keenly is the hole where it used to be. It feels like something or some part of me has died. Back to work and the prospect of a week back in real life. Meetings. Email. Phone calls. Clients. I was just starting to feel that I had settled into that role again and circumstances changed – almost before it all had really begun. 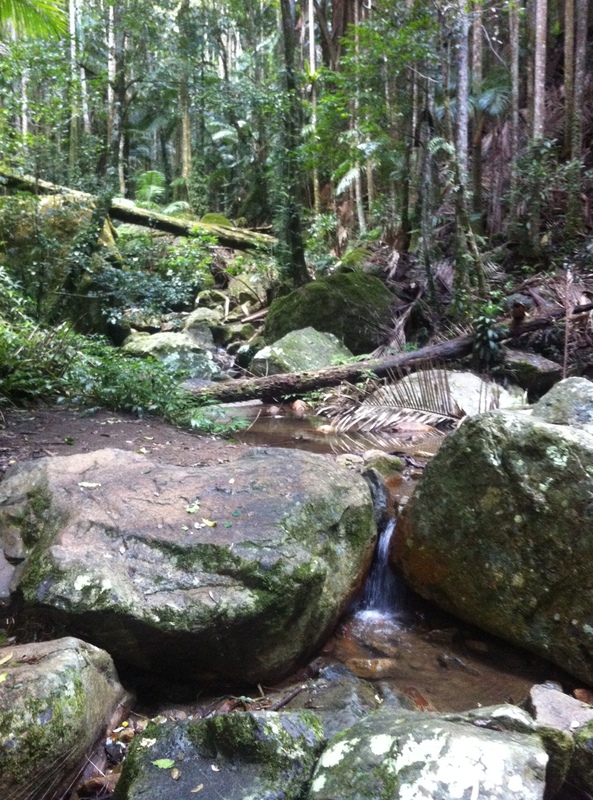 I found myself driving to northern New South Wales for what was to be two wonderful nights together in a cabin by a stream in the rainforest at the foot of Mt Warning. In the mornings I sat in meditation on the deck and tried to just be. To just see. The water. The birds. The trees. Green everywhere. So much life everywhere. Vivid greens full of life. But unexpected things can happen when you sit and try to just see. To just be. The rotting. The decay. The destruction. The trees. So much death everywhere. It was lying on the ground and it was hanging from the trees. Vivid greens full of death. And then, almost before it had begun, it was over and I was driving back to Brisbane and back to real life. Email was where I started first. A close friend had wonderful news. An unexpected invitation to a new beginning of something she loved dearly. The creation of an exhilarating new future. Phone calls was where things went next. A close friend had terrible news. The unexpected beginning of the ending of someone she loved dearly. The creation of a terrifyingly possible new past. Then a moment in the kitchen. A hug from my daughter. “I love you Daddy.” The unexpected creation of a loving new present reminding me to be here now. Finally a late night text message not seen until morning. A close friend had news. She had not seen. Could not have seen. The unexpected reconstruction of the past – perhaps even of the self. The destruction of what was, the creation of a huge hole in her life where what ever “it” was used to be. New light flooded in, illuminating places and faces and times that had previously been dark. Creating space for the growth of a new, brighter future out of the unexpected reconstruction of the past. So much life everywhere. So much death everywhere. It hangs from the trees and it brushes up against you in the night. Without death, all kinds of deaths, there can be no life. Until we take the time to sit, to try to be and to try to see, all we see is the life in the trees. And then “it” is over. Seemingly before any of it had really begun (whatever “it” is – a career, a relationship, a moment, a life, a fiercely defended perception of who I think I am or was). What we feel most keenly is the hole where that used to be. But it is the hole that creates the opportunity for new life. Letting the light in and creating space for the growth of a new, brighter future out of the unexpected destruction of the past and the reconstruction of the present. Perhaps then what we feel is not the hole where something used to be? Perhaps it is only through brushing up against death that we become alive to the new possibilities that living offers us? Perhaps it is the tension created by that vast potential that we feel most keenly? Just like that moment as a child when it was you hanging from the tree. Afraid to let go of the branch. Sure you would be hurt by the fall. Terrified. Exhilarated. Present. Thank you Susie. I know that I am often too quick to believe that I am the only one who is feeling “like this” today. That I am the only person who could feel like this today. The truth is we are are never alone but “always present in each other’s company”. That’s blogging’s gift to the world. Real voices with an immediacy that touches us right now. Voices who help us understand we’re never really as alone as we may imagine.Voices that bring us together in a shared humanity. Your voice is among that chorus.